The robot teachers are programmed for their jobs, They will always obey, They are the solution to the education, They can teach you technological skills, They can teach poor kids that have no chance to go in contact with technology and they do not have to get paid. The robot teachers are better than the human, They are new & they will have new methods, The teachers have the old methods while the robot teachers have up-to-date methods, If the robots become the teachers , They will only be in the elementary schools and the pre-schools. The robot teachers are mainly used as the classroom assistants in the elementary schools, Some robots can transmit the video from far away places, so, the teacher does not have to be in the classroom if they do not live in the country, The kids not only love the robots, but also the robots benefit the kids in the classroom. The scientists think that the social interaction with the live human being is crucial for learning to take place to the children under 1 year, In the future, more and more of us will learn from the social robots, especially the kids learning pre-school skills and the students of all ages studying a new language. The social robots are being used on the experimental basis to teach various skills to the preschool children, including the colour names, the new vocabulary words and the songs and they can save the money for the schools by not having to pay the teachers. 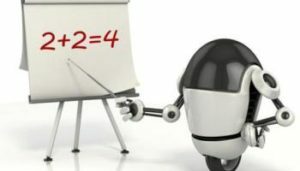 In the future, The robots will only be used to teach certain skills such as acquiring the foreign or new language, possibly in the playgroups with the children or to the individual adults, But the robot teachers can be cost-effective compared to the expense of paying the human teacher. Relying on the technology for the classroom instruction creates an even playing field where all the students are learning everything that needs to be covered according to the curriculum standards and they should have well-educated, high quality teacher in the classroom. The students are all also receiving the same high quality information, using the robot teacher for the student instruction can greatly cut down on the teacher salary costs, By placing the burden of teaching the lessons on programmed instruction. SMART Boards are interactive white boards which can project computer displays and allow the students to interact with them through touch, SMART pens help the students to write on the screen & the board can translate the student’s handwriting into the computer text and then save it as a document file on the connected computer. While the technology can be the great tool for promoting interactive learning and providing the information beyond the scope of the teacher’s knowledge base, It can not replace the intrinsic value of having the human devoted to the child’s educational development present in the classroom. Many schools don’t have a lot of money, They don’t pay their teachers, So, they will not afford the robot teacher even at the cheapest price, The robots need the electricity and the electricity costs a lot. The robot teachers do not have feelings, They are not able to help you to get over things and help you feel better but the human teachers can and the robot wouldn’t know what to do. If we converted to the robots, The teachers and staff worldwide would lose their jobs, The robots are not able to develop the personal distinctions between the students. Implementing this technology in the classroom requires the existing infrastructure for the electricity and Internet, an instructor device (desktop/laptop/iPad)is needed to connect to and the software to enable the use of all aspects of the hardware. The robot teachers are higher cost technologies in the developing world, The software is employed on low-cost laptops, desktops or tablets to simulate the teacher instruction. In these classrooms, The entire curriculum can be imparted to the students through the computer program, making a quality human teacher unnecessary. There are no inspiring robot teachers, They are all programmed to spit the knowledge out at the students and expect the students to spit it back at them. The robot teacher can not develop the creative or innovative ideas for teaching the material in a new way, It can not comment on the papers to provide the students with valuable positive feedback or the critiques. The robot teacher can not pull the struggling student aside and determine if there are personal issues related to his/her performance, It can not encourage the students with the particular strength & interest in the subject to consider certain career paths. In developing regions, Employing technology as the alternative to the human instruction makes it is difficult to gauge the design specifications for the effective instructional software. teachers love the students , They help them , The teacher is the best friend to the student . You’ve clearly thought about this in a lot of detail. This is a great piece of writing. Pros and cons of technology in education & Can technology replace teachers? thank you for the information it is very informative and it has helped a lot with my research.